Categories: Polygamy, Religion, Self-Worth, Spirituality | Tags: free-spirit, freedom from religion, inspire, life after religion, passion, resurgence, resurrection, second coming, self-worth, spiritual freedom, spiritual liberation, transcending fear | Permalink. As a child I was taught that Easter was a Pagan holiday and therefore an evil holiday. We believed that Jesus was born on April 6th. That he died on his 33rd birthday, followed three days later with his mysterious resurrection. Rather than an Easter celebration we had a birthday celebration, with birthday cake and all. It was a celebration of Jesus in his physical life and his promise of eternal life. Slowly the eggs, bunnies and other “worldly” aspects of Easter sneaked their way into our secluded community. For many years I felt very confused about what bunnies and eggs had to do with The Christ’s resurrection. Long after many families in the community gave up the strictness surrounding the celebration of Pagan holidays, my father was a stickler about it. My first official Easter egg hunt didn’t come until I had kids of my own and a real reason to celebrate. Until recently I did not understand what father meant by “Pagan” and now I finally do. Knowing what I now know, Easter has a whole new meaning. For me it is a celebration of resurrecting the Divine Feminine. There is nothing bad or evil about Paganism. What could be so wrong with celebrating our Mother? Why did we feel it so necessary at one point in our human evolution to belittle the Divine Feminine and reduce Her to nothing more than dirt? In reducing Her and all of Her qualities we have nearly destroyed our home. As we created the belief that the God is only masculine, we forgot about our feminine. As we forgot about our Mother we deprived ourselves of really knowing Her unconditional love, compassion and support. And yet, even without Her acknowledgement, She has continued to support us, feed us, clothe us, heal us and love us. She has continued to shower us with Her abundance, even as we bleed Her dry and abuse Her. That is unconditional love of a mother. Unconditional love is not the narcissistic and egotistic love of the Divine Masculine I was raised with. We now live in an amazing time of our human evolution, when more and more of us are waking up from our dark slumber and rising above our fear-based beliefs. This is the time of the great resurrection and ascension that has been foretold. It simply doesn’t look the way so many expect it to look. It is the resurrection of the Christ Consciousness. It is the resurrection of unconditional love, that energy that is at the heart of the Divine Feminine. We are restoring the Divine Feminine to Her rightful place in balance and equality with the Divine Masculine, as we now understand that both masculine and feminine are necessary for all creation. As humanity comes together as one family we now see the true value of feminine qualities and propensities. After thousands of years of being put down and treated with worthlessness, true feminine qualities are being restored to their true power. Reminding us that love really is the most powerful force in the universe. In resurrection the Divine Feminine and Her love-based energies we are restoring balance to the planet. 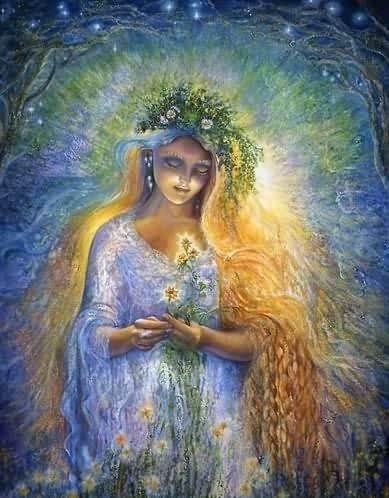 With Her comes the much needed love, compassion, healing, communication, creativity and abundance that is needed to mend and re-create our world. Categories: Inspiration, Religion, Spirituality | Tags: ascencion, christ concousness, divine feminine, divine masculine, easter, eostre, eternal life, god, holiday, Jesus, pagan, paganism, resurrecting the divine feminine, resurrection | Permalink.